I am not a huge movie fan. I had to take film courses in university, where we analyzed the life out of movies. This really took the fun and enjoyment of movies for me. I do have a hand full of movies that I love and watch at least once a year- which for me is a lot. I love the message of this movie: don't be afraid to be yourself, consider all of your options and break away from traditional roles. While I am by no means a feminist, or at least I don't consider myself one, this is a movie that always makes me feel optimistic, empowered, that I can accomplish anything. 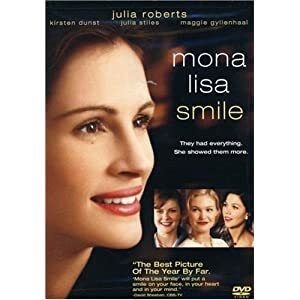 Staring Julia Roberts, Kirsten Dunst, Julia Stiles, Maggie Gyllenhaal and Ginnifer Goodwin, with Marcia Gay Harden, Juliet Stevenson and Topher Grace.